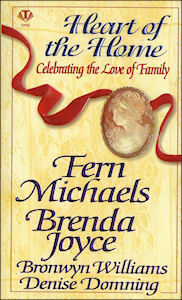 Here, in this very special collection, are four exquiste tales by today’s most beloved and talented writers of romantic fiction. Shimmering with emotion, brushed with scandal, and touched with insights into the human heart, these wonderful stories of loss and renewal show us that the power of love is immeasurable. So celebrate the gift of children and the calling of motherhood with this evocative and richly drawn treasury of love and hope by authors who know that home is where the heart is. In “The Awakening”, Brenda Joyce brings us an unmarried lass “in touble” in Boston who finds out she is not so alone after all. *loosely connected to The deWarenne Dynasty and O’Neil branch of the family. “Stop her!” he shouted. “Stop her!” She’s killed him!” He looked up aghast. Meg didn’t pause. The grog shop was dark, crowded, and noisy even though it was well before noon. No one heard Timothy. The body separated them. She whirled, tripping over one burly thigh, pushing past a group of men swigging Irish whiskey and arguing amiable about a racehorse that was centuries old. Her heart thundered in her ears. Her mind was frozen with one thought. Oh God, he was dead. She had killed O’Leary! Meg ran as heads began to turn and whip her way. Eyes caught hers, surprised—accusing. “Stop Meg O’Neil! She’s killed Robin!” Timothy screamed. Panting, a cramp piercing her side. Meg shoved through shoulders and hips that suddenly seemed to bar her way and fled out of an open doorway into the bright morning sunlight, Timothy’s cries behind her. Other voices had joined the younger man’s. Meg leapt off of the grog shop’s porch. She did not have to look back to know she was being followed. The tattered shawl she was wearing slipped, sharp stones and pebbles hurt her feet where her shoes had worn paper-thin, but she did not notice. Red hair unbound and flying behind her, she ran from Fort Hill and the men who would catch her in order to kill her.